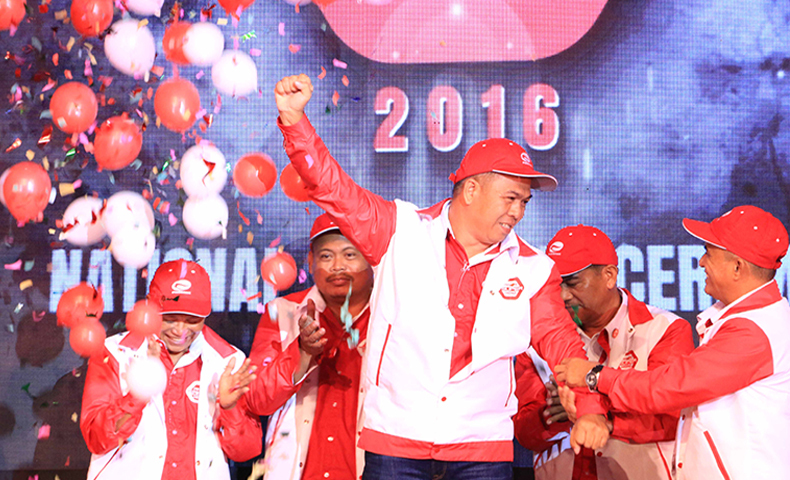 A Barangay Kagawad from Iloilo City emerged as the Pinoy Tsuper Hero 2016. Edwin Escamos, 45 years old and a jeepney driver/operator is the grand champion of the second season of Pinoy Tsuper Hero: Ang Muling Paglipad. Dubbed as the Tsuper Leader of Iloilo, Escamos embodied the best traits of goodness (kabutihan), excellence (kagalingan), honesty (katapatan) and environment stewardship (pagkamaka-kalikasan) among all the finalists. He received a cash prize worth Php100,000.00, a new tricycle and Php1 Million worth of insurance for his family. “Hindi ko ma-express yung saya. Nagulat ako. Bakit ako? [But this is truly] rewarding on my part. It’s God blessing na ma-acknowledge yung contribution ko sa aming community as well as sa mga katulad ko ding tsuper,” Escamos expressed. Iloilo City is one of the thirteen sites featured by the Phoenix Petroleum for the second season of Pinoy Tsuper Hero in partnership with the ABS-CBN Lingkod Kapamilya. Other finalists include Roldan Marasigan of Lipa, Batangas, Godofredo Datinguinoo of Bauan, Batangas, Johnny Millana of Olongapo City, John Estrada of Cagayan De Oro City, Joey Caballes of Davao City (first runner-up), Marion Magno of Cabadbaran City and Rogelio Agor of General Santos City. Each finalist received Php20,000 cash and Php15,000 worth of gift certificates from Phoenix Petroleum. The ABS-CBN Regional Network Group also played a crucial role in the success of this campaign nationwide. BAYAN Academy facilitated the selection process and training program for the chosen drivers from all over the country. ABS-CBN Lingkod Kapamilya Managing Director Susan Afan expressed her gratitude to Phoenix Petroleum for recognizing excellent drivers since 2015. “It is our hope in our Foundation that Phoenix Petroleum continues its advocacy. We believe that there is no superhero but that there is a superhero in every Filipino driver. And all we need is this encouragement, this challenge and inspiration to put on that faith,” she articulated. Phoenix Petroleum President and CEO Dennis Uy praised the new Pinoy Tsuper Heroes for their exemplary performance before, during and after the competition. “Asahan ninyong kami sa Phoenix Petroleum ay lagi ninyong kasama sa paglilingkod sa kapwa at sa pagkamit ng inyong pangarap,” he assured the drivers. ABS-CBN Lingkod Kapamilya Chairman Eugenio Lopez III also congratulated the finalists. “Tunay kayong mga bayani. On behalf of ABS-CBN Lingkod Kapamilya, salamat sa Phoenix Petroleum and to BAYAN Academy for taking our Tsuper Heroes to the most exciting journey of their lives. We hope you will continue this laudable advocacy in the years to come,” he enthused. Announcements for the launching of Pinoy Tsuper Hero Year 3 are coming out soon.